Many people interested in selling their old gold jewelry and other gold scrap are not sure what they should send in and what they shouldn’t. They have questions about if a particular piece of jewelry or a knick knack has enough gold to be worth selling or if they should try to find another means to sell it. In order to really know if a particular piece of gold has value to a gold buyer; an understanding of gold markings and its associated purity is needed. As with many other precious metals and gems, the purity of gold is measured in karats. Karats represent how much gold is in a particular item. Karats range from 24 karat gold (the purist) down to 10 karat gold. While it is possible for a piece of jewelry to contain less than 10 karat’s this is generally the lowest amount anyone is willing to accept as gold content. An interesting thing to know is that 24 karat gold is actually quite rare in the United States. While countries in Europe and Asia have a market for this purity of gold, many people in the U.S. find 24 karat gold far to soft and supple for their taste. For the most part High end jewelry in the U.S. has an 18 karat value, which still keeps the gold looking like gold but is stronger than pure gold. For the most part lower karats of gold are mixed with silver or other harder precious metals in order to give the gold a little more durability. Now that we understand how gold purity is classified the next step is figuring out how to determine how pure the gold you are thinking of selling is. On jewelry there should be a jeweler’s mark with a number followed by a k. Most often these marks will appear on the clasp of the piece, however sometimes they are put in other areas. While it might be a little time consuming, sometimes a link by link search is needed to find the gold mark on a piece of jewelry. If you do not find a mark then chances are that the piece is plated or gold filled. Gold plating is created by a process of binding a shell of gold to another piece of metal (usually silver) to give the piece a gold appearance without using too much gold. For the most part gold plated pieces are not of interest to buyers, and the piece is probably worth more for its silver content than its gold content. Also, another thing to know is that jewelers in the U.S. and Europe mark their gold differently. 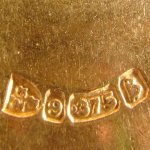 In the U.S. a piece of jewelry is marked with a number (generally 10, 14, 18, 21 or 24) and this number is followed by a K. However in Europe they use their marking to represent the gold percentage. For example 21 karat gold is 87.5% pure gold so a piece of jewelry marked by a European jeweler (or meant for sale in Europe) will be marked 875 instead of 21K. While this may seem confusing just remember that the higher the number the more pure the gold. The reason that gold plated jewelry is not worth much is because the process of smelting down gold and getting rid of impurities is both time consuming and expensive. Gold plated jewelry often does not have enough gold content to make getting the gold from it worth the expense and time it would take. So when you are thinking of selling your gold scrap, make sure that most of it is of 10k or better purity. Another thing worth mentioning is the colors of gold and their relationship to the purity of the gold. The actual color of gold is a bright yellow. The more yellow the gold, the more pure the gold is. However, by adding different metals and alloys to gold many other colors can be created. For instance white gold is created by combining gold with a zinc or nickel. Rose colored gold uses copper and green gold uses an alloy of silver, zinc, and copper. When these metals are mixed with gold it causes a different hue. Even if the gold you are interested in selling is a colored gold (and thus not pure gold) it still has value and should still have a karat mark of some kind. While the karat of colored gold will seldom be above 18K it still has value as gold and you can still sell it to a gold broker.